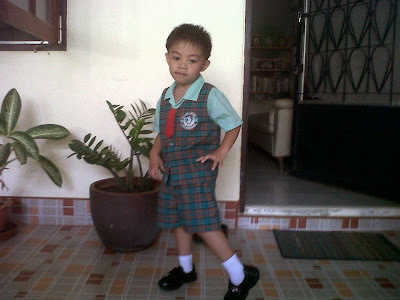 This is my cute little boy with his Monday school uniform. We were so excited to see him in his school uniform. He even likes to wear it too. I think he was ready to be in school even his 3 years old and 6 months. 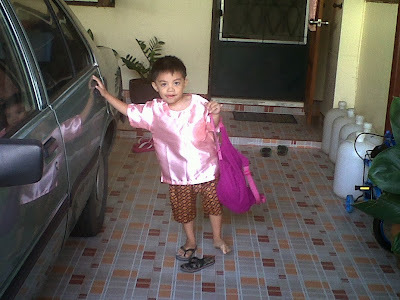 It seems that we were not ready to let him go to school. But because he likes it we granted his desires. One thing we observed to him was, he really longed to have friends. Next was his Friday school uniform. He doesn't like this kind of uniform. He is always complaining that he doesn't want to wear this because this is for the girls. He was used to it after few times wearing it. The only problem we had is, it's hard for him to wake up early in the morning. This is the best training experience he has now.